Home » Featured » Here come the holidays! The Cooloola Coast is the PERFECT place for school holidays. Walk on the beach, there are lots of rocks to climb and rock pools to discover. Have a swim, build a castle. Ask your adult to take you to Carlo Sandblow, Poona Lake and Seary’s Creek. See the dolphins at Tin Can Bay, and ride or walk along the esplanade. If you are after MORE fun, here’s everything creative in this list, and we have activities to get physical – off-road bikes, squash, fishing, paddle boarding, even surf-skating! Enjoy your holiday on our coast. Surf – Skate aims to mimic surfing skills on a specially designed surf-skate board. 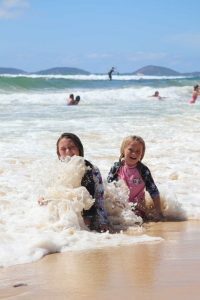 Rainbow Beach Learn to Surf is running surf-skate workshops, and ‘learn to surf’ programs for the school holidays. The issue surfers have is wave time. Wave selection, and time on the wave where you can work on speed generation, turns, linking manoeuvres and getting your body to put all these together. By making mistakes you get very little time on the ride phase when you’re out for a session. The surf-skate program links in with surf lessons to instruct on the ride phase of learning to surf, so If you’re keen to try out a surf training skateboard call 0435934087 for an intro session! Last month’s Sunfish Kids Fishing Day was booked out – there are still a few places left for Sunday April 14. So why is it so popular? It’s free, the focus is on fun and enjoying recreational fishing. Plus kids are presented with a new rod and reel, a tackle box, and a Certificate of Attendance plus water, morning tea and a hearty BBQ lunch! Essential skills are taught – you’ll be able to tie knots, rig a rod, learn baiting and casting and then fish the tidal area at Norman Point. All this is thanks to the qualified Sunfish Instructors from Tin Can Bay Fishing Club. Registration is essential and at least one responsible adult is required to accompany their child (aged 7-15 years) for the entire day. Be at the Tin Can Bay Country Club on April 13 from 4.30pm for some fun on the green. $10 per person includes snacks. Stay for a meal in the Chinese Restaurant and live entertainment by Arthur Black from 6pm. Cook Up Yum Yum at the Cooloola Cove Veterans and Community Hall. Simple but delicious food made to eat afterwards, on Tuesday 9 from 10-11am. Touch Football from 4-5pm on the Tin Can Bay Foreshore Wes Mitchell (skate) Park. A casual game for fun and fitness on Friday 12 from 4-5pm. Easter Craft at the Rainbow Beach Community Hall. Relax while you snip, glue and draw the morning away on Tuesday 16 from 10-11am. Games Galore at the Cooloola Cove Veterans and Community Hall. Don’t be bored these holidays, be board game happy on Thursday 18 from 10-11am. Holiday Craft Bar – stop by the children’s area at your local library branch between April 8 – 18 for free craft activities during the school holidays. Suitable for children aged 5-12 years and their carers. At Rainbow Beach Library, Wednesdays 3–4pm and Tin Can Bay Library, Monday – Friday 11am–12 noon. Horrible Histories: Measly Middle Ages – join an amazing morning taking a look at the Measly Middle Ages. Learn some cool facts about life in Medieval Europe, compete for the crown in the Middle Ages Trivia Tournament and create some medieval craft. Suitable for children aged 8-12 years. Bookings are essential at Rainbow Beach Library, Friday April 12, 3-4pm. Have you seen my Dragon? Join in with activities and craft based on the book Have you seen my Dragon? written by Steven Light. Suitable for children aged 5-7 years. Bookings are essential at the Tin Can Bay Library, Friday April 12, 11-12 noon. Medieval Science – Look back at the amazing discoveries and scientific designs that were created during this period. Try your hand at the Leonardo da Vinci Bridge challenge and see if you can be the winner of the flying machine race. Suitable for children aged 8-12 years at Tin Can Bay Library, Thursday April 18, 3-4pm, bookings essential. Hack and Whack Storytime – inspired by the book by Francisca Simon, come and join this special storytime and make your own Viking shield. For children aged 5-8 years at Rainbow Beach Library, Thursday April 18, 10-11am, bookings are essential. Map Making Workshop – using folk tales as inspiration, learn the skills and techniques of narrative map making. Learn to explore your own worlds with ink and pen. Join illustrator Kathleen Jennings who has created maps for books such as Holly Black’s The Cruel Prince and The Wicked King and Christopher Rowe’s Telling the Map. At Gympie Library, Monday April 15, 1 – 3pm, bookings are essential for kids 10+ years. With the school holidays and Easter break approaching, our Local Ambulance Committee warn parents of the dangers for children around campfires. Apart from the obvious need to supervise children near a fire, parents need to be aware of the correct way to extinguish a campfire. Sand or dirt should not be used, as heat up to 100 degrees Celsius can remain for over eight hours and children have been burnt stepping on the site of a campfire. A fire put out with a bucket of water will retain little or no heat after a period of 10 minutes. If burns occur, they should be treated with cold running water and medical assistance sought immediately. Gympie Gallery has a host of workshops and fun during the holidays. Check out kids on tour APT9 activities plus a fun day. Make a mythological dragon from air-dried clay or create Easter arty goodies and weave a basket to put them in! Details in our What’s On page. This activity is designed for children who are keen to be active and gain new skills while learning about the amazing game of squash. Wear your sports shoes, bring water/drink and your enthusiasm! Wednesday 17 April at Victory Squash Centre, 41 Browns Road, Victory Heights 9.30 – 11am for children 10 and under (must be supervised by an adult), bookings are essential. Visit comeandtrysquashunder10.eventbrite.com.au, for the 10am – 3.30pm activity, and for children 10+ years visit comeandtrysquash10plus.eventbrite.com.au, 20 places for each session, $3. Go moth mad and join in free arty crafty activities at Gympie Central Shopping Centre with Mara. Lots of creative fun held upstairs near the Food Court. Bookings essential. Wednesday 17 April, Gympie Central Shopping Centre, 10am – 1pm, for all ages, free but booking is essential. Explore the local off-road mountain biking area at Victory Heights Trail Network. Bookings essential. Remember, Bingo is held every Thursday at the Tin Can Bay Country Club and the first Monday of the month at the Rainbow Beach Community Hall, both from 9.30am. Festival of Small Halls is almost here!